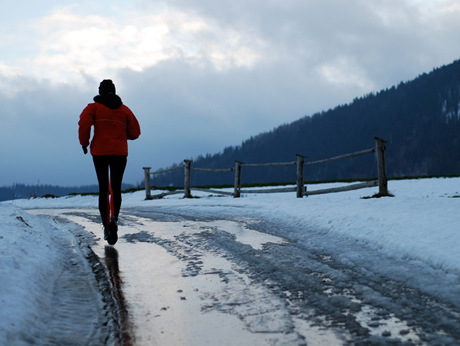 Staying fit and active as the temperatures start to dip can be a challenge. Here are some quick tips to help keep you moving. Wear clothes that are fitted under all those layers. This will keep you on track as you will still be showing those killer curves once the layers of scarves, jackets, and over-sized sweaters peel off. Show your hard work from summer off through the winter months! Find new outdoor routines to keep you moving and active. Winter sports like skiing, snowboarding, snowshoeing, and even ice skating are great and fun ways to stay active in the winter months while indulging your lungs with some fresh air. Pack some warm apple cider or hot chocolate for a treat mid-point and trudge on. If you love to run outdoors, keep on running! Sign up for a 5k or 10k this fall and winter. Just put on some extra layers and invest in some winter running gear and you are on your way! Plan a midwinter vacation and set goals for yourself on where you want to be with your fitness goals. If you are tight on funds this year host a fun beach themed party indoors, turn up the heat, and make your venue fit for summer in winter. After all there is such thing as Christmas in July right? Why not have a summer in the winter event! If you currently want to start a workout routine; then this is the perfect time! Your body doesn’t need to be on display and you will have the entire fall/winter season to get your routine polished and your body looking and feeling amazing! So what’s holding you back? Trust me your body and mind will thank you in the spring when you find yourself in tip top shape for the warm spring and summer months. Maintenance is key! Next Post Don’t Give Up – Get your sweat on!